Herrings are an oily silver fish known for their numerous health benefits, including being a great alternative source of vitamin D – the vitamin also found in sunlight. It makes sense, then, that herrings are incredibly popular in northern Europe – as opposed to the sun-drenched Mediterranean – and pickled or preserved herring holds a strong place in the national cuisine of Germany, Holland and the Scandinavian countries. 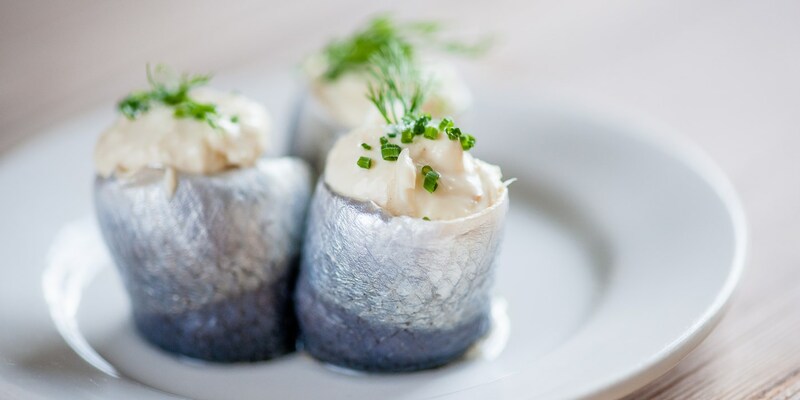 While the fish is considerably less common in the UK, its popularity is growing with British chefs and home cooks alike coming round to the distinctive oily taste of herring. Let's face it, with British weather being what it is a little more vitamin D in our diet can only be a good thing . . . This collection contains some fantastic herring recipes, including some inspiration for unusual seafood starters. When pairing flavours for the dish, think carefully about offsetting the rich, oily flavour of the fish with a punchy dressing or marinade. Andy McLeish opts for a sweet cure for his fish but lifts the dish with fiery fresh horseradish in his Marinated herrings recipe, while Martin Wishart serves his pickled herrings with a heady kombu broth. Similarly Emily Watkins, inspired by the traditional Dutch dish, updates her classic Soused herring recipe with a Bloody Mary sauce.